Michael's On East Co-Proprietor Michael Klauber is extremely humbled to named as SCOPE's 2017 Boundary Crosser. 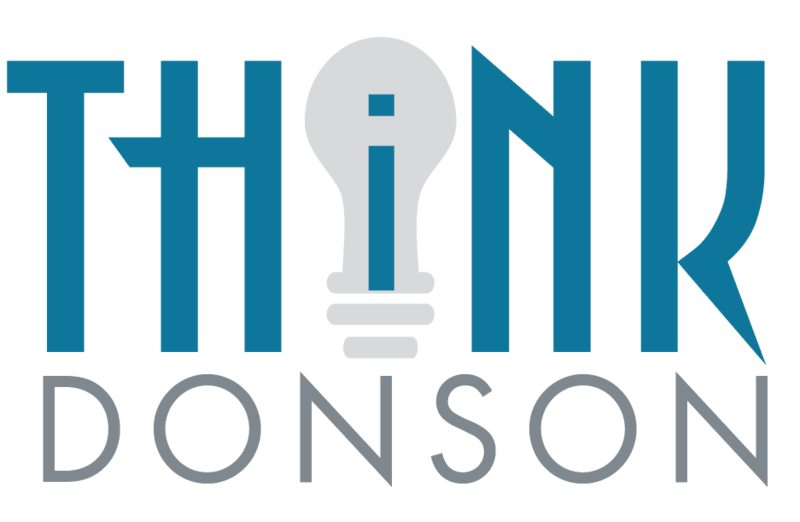 The nonprofit organization constantly "Inspiring and Connecting Citizens to Make a Better Community" will honor Michael at their Annual Celebration at 5:30 pm on Wednesday, October 11 at the Michael's On East Ballroom. Click here for event details and tickets. Here at SCOPE, we are looking forward to honoring Michael Klauber as the 2017 Boundary Crosser at our Annual Celebration and Boundary Crosser Award – at Michael’s On East, of course! Michael has been a leader in his industry but we are especially proud to honor him for his work on Sarasota Bayfront 20:20. A Boundary Crosser is a leader who “connects people across lines that traditionally divide community.” Michael’s efforts brought neighborhoods, leaders, business, nonprofits and government to the table to envision what a restored and revitalized downtown Bayfront could look like. Community leaders say they have never seen anything like the group of citizens who assembled together as stakeholders on this project. You’ll hear them talking about this and more on the award video made in honor of Michael Klauber. *** Kudos to the "MOE" staff: During the making of the award video, Phil Mancini told filmmakers that the dedication of the MOE staff enabled Michael to dedicate himself to Bayfront 20:20, now known as The Bay. Created by Michael’s On East Executive Chef Jamil Pineda as part of the Spanish Epicurean Adventure in September 2017. 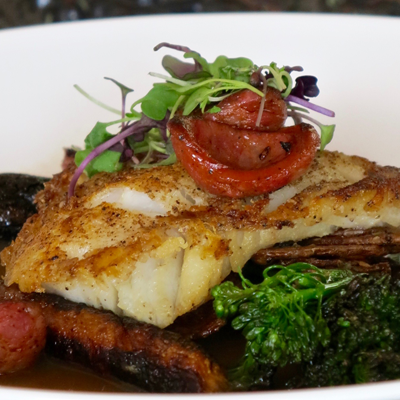 This dish will be featured on the dinner menu through September 30th at Michael’s On East. This recipe will be featured on ABC 7's noon news broadcast as part of Chef Judi's Dish on Thursday, September 21, 2017. Heat the oil in a skillet over medium-high heat. Add the onions and garlic, and cook until the onions are translucent. Add the bell pepper and sauté until tender. Season with salt, pepper, cumin, oregano and bay leaves. Continue cooking until the mixture looks like a green paste with oil around it. Stir in the (optional) tomatoes and continue cooking, stirring until all of the liquid is released. Gradually stir in the tomato sauce. Simmer until the sauce becomes a vibrant red color. Taste, and adjust with additional seasonings if desired. Remove bay leaves and set aside until the dish is ready to be plated. 18 oz Grilled Smocked Longaniza (cut on a bias) Tip: This angled cut creates elongated, oval-shaped sections which result in an elegant presentation. In a sauté pan over medium high heat, add the oil. Season both sides of the fish fillets with salt and pepper. Sear the fish on both sides, add the mussels, Sofrito sauce and clam juice and let simmer until the mussels are open. Add the sausage pieces. Using six pasta bowls, evenly portion one fish fillet, 4 mussels and sausage slices into each bowl. Ladle the sauce on top of the fish and serve! We are hopeful the restaurant will be able to open for Thursday evening. The wine cellar and catering operations will follow suit. Of course, the situation is fluid and subject. 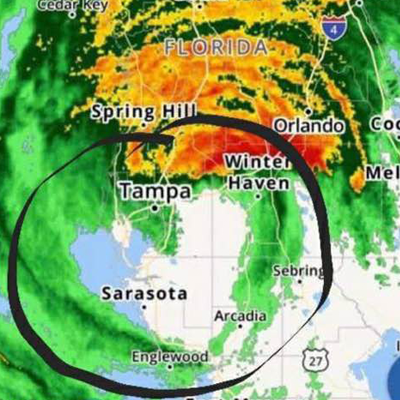 We will also keep you informed as our cafe at Selby Gardens is able to return to normal operations. 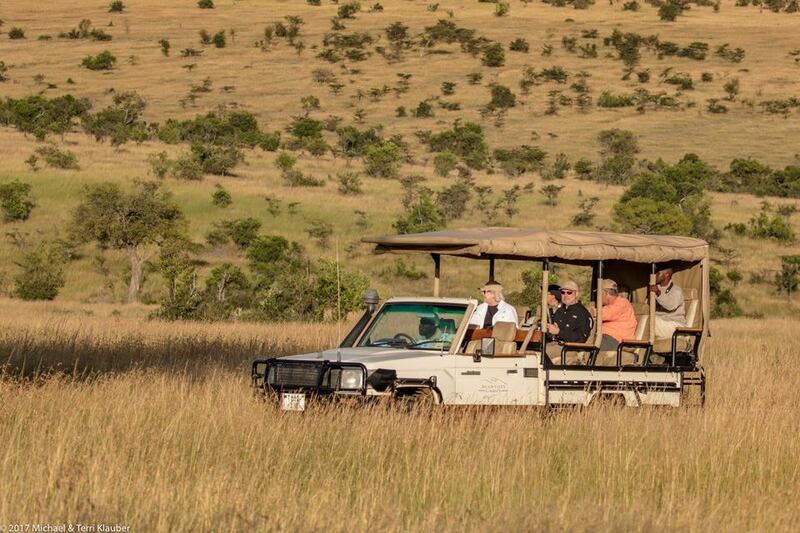 Inspired by the Gulf Coast Connoisseur Club travels, the passion to support digital learning in rural areas of South Africa, and to honor an important legacy, our very own Safari Sarasota was created! 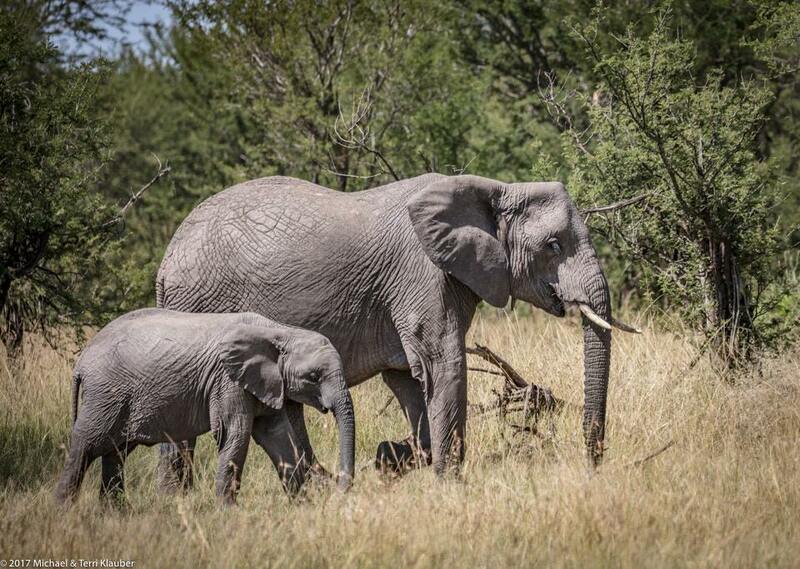 Please join us for SAFARI SARASOTA events with Chef Anna Ridgewell from South Africa’s Londolozi Game Reserve! Michael and Terri Klauber invite you to join them for a series of exciting events this fall. 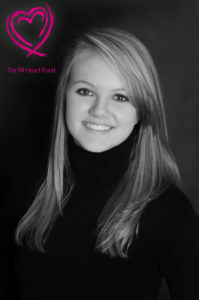 Held bi-annually in Sarasota since 2013, a series of "Safari Sarasota" events benefit the All Heart Fund, which was created in honor of Leanna Knopik, a 16-year-old Sarasota native who passed away almost a year after visiting some of South Africa’s most remote communities. 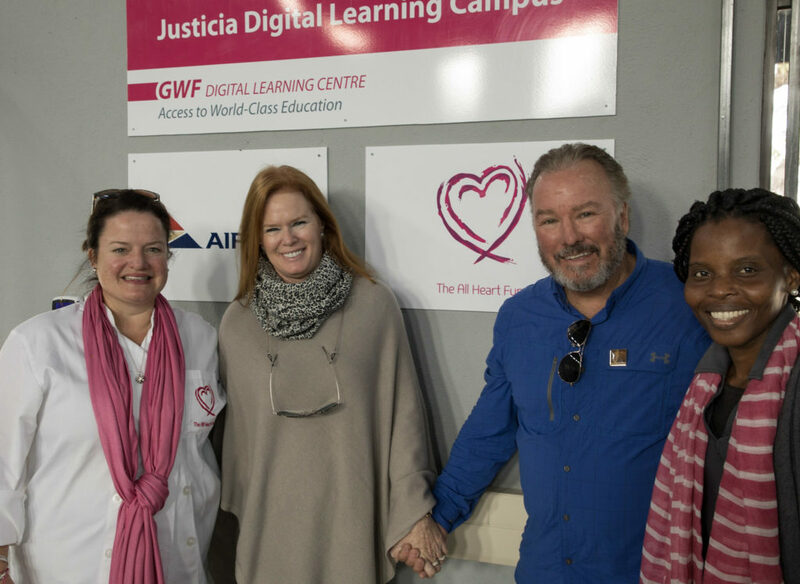 It had been Leanna’s dream to support children and education in South Africa and, over the last two years, the All Heart Fund, in partnership with South African not-for-profit organization, Good Work Foundation, has provided digital literacy access to over 1,500 South African schoolchildren per week. 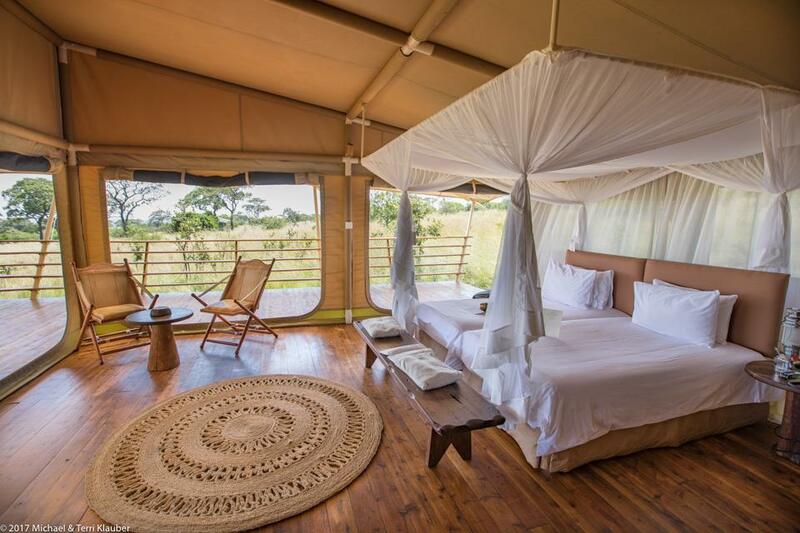 Please secure your room reservation now for SAFARI SARASOTA with Chef Anna Ridgewell from South Africa’s Londolozi Game Reserve! This is a not-to-miss dining experience which will electrify the Michael’s On East Ballroom! Click here to register for the Interactive Cooking Dinner on Thursday, November 2. Join us for an evening of African gourmet food and friends featuring award-winning South African wines, an interactive safari-inspired dining experience with one of Africa’s top safari lodge chefs, and a celebration of the All Heart Fund, a Sarasota-based initiative that is helping to deliver education technology to rural, low-income South African schoolchildren. Be prepared to COOK table-side as each guest becomes a"chef" and takes turns cooking at your table! Guests follow along with Chef Anna's simple recipe instructions and prepare each course with pre-measured ingredients for their table. Fabulous South African wines will be served alongside each of the four courses too! 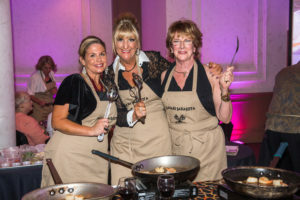 Happy Chefs at Safari Sarasota 2015! 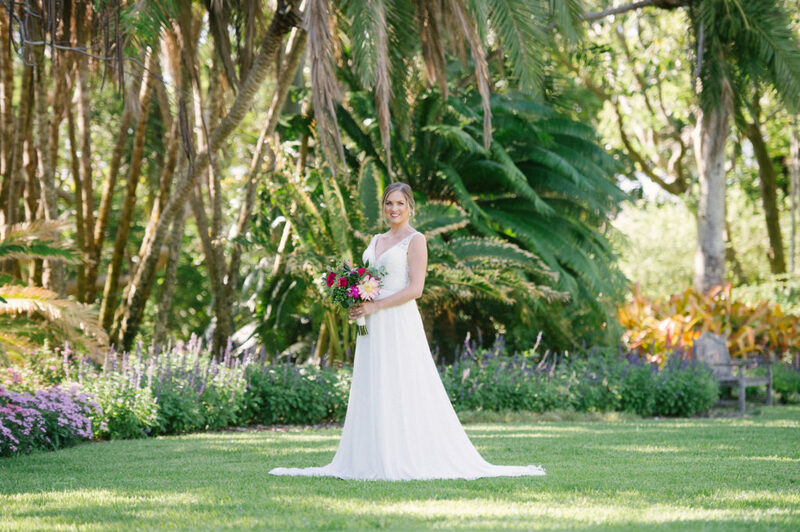 A magical evening awaits under the Banyan Trees & African Sky at Selby Gardens as Chef Anna presents a traditional “bush dinner” perfectly paired with South African wines. 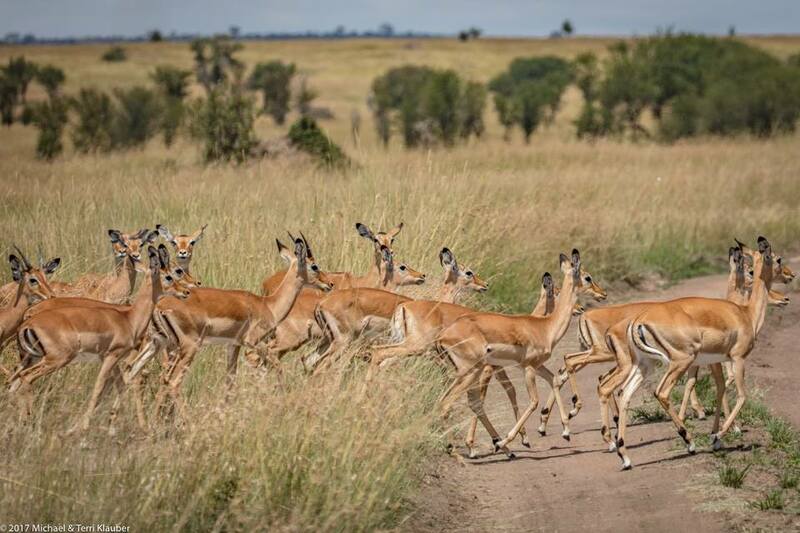 A casual, walk-about tasting with prized wines from the Cape Winelands will be the perfect finish to Safari Sarasota festivities. 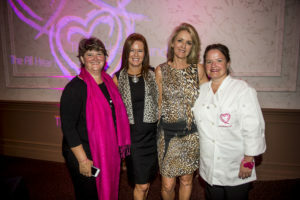 Safari Sarasota 2017 is presented as a series of events in support of the All Heart Fund established in honor of Leanna Knopik at South Africa’s Good Work Foundation. A fundraiser for the All Heart Fund of the Good Work Foundation, a nonprofit in South Africa which delivers digital-era literacy education and career-training to children and adults living in rural communities. 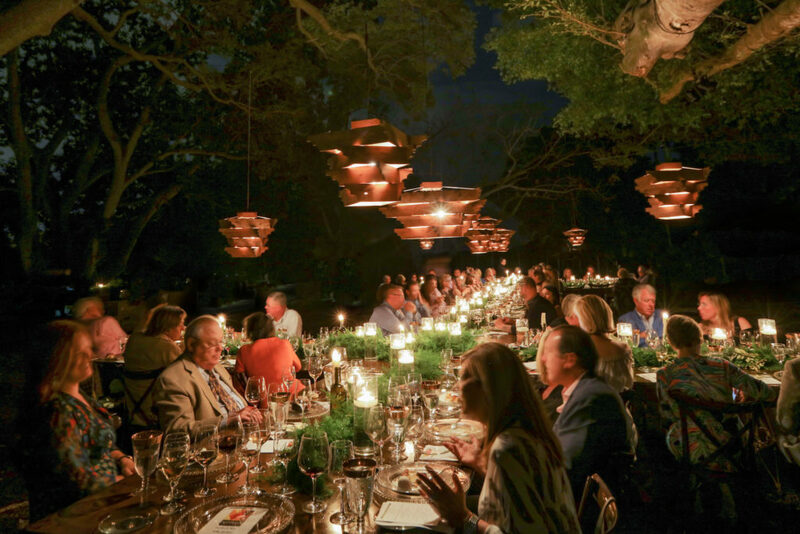 Londolozi Game Reserve Executive Chef Anna Ridgewell and Kate Groch, CEO and Co-Founder of the Good Work Foundation and curator of the All Heart Fund, will journey from South Africa to host an interactive dining experience in the Michael’s On East Ballroom. 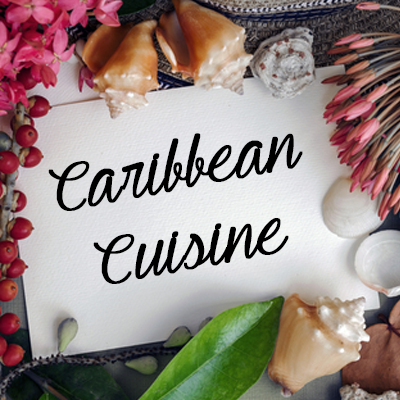 Michael’s On East is thrilled to host this special opportunity for guests to enjoy the flavors of the historic Spice Route paired with some of South Africa's finest wines. 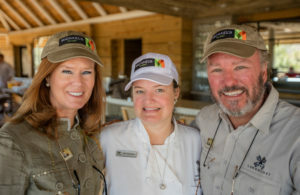 Michael and Terri Klauber have become close with Chef Anna and the entire Good Work Foundation team in South African through a shared passion for this important cause and enthusiasm for the magical land of South Africa explored bi-annually on Gulf Coast Connoisseur Club journeys. GWF USA Foundation is a 501(c)(3) organization that supports a mission to deliver digital literacy education and career training to people living in rural, often neglected areas of southern Africa. A COPY OF THE OFFICIAL REGISTRATION AND FINANCIAL INFORMATION MAY BE OBTAINED FROM THE DIVISION OF CONSUMER SERVICES BY CALLING 1-800 HELP FLA (800 435-7352) TOLL-FREE WITHIN THE STATE OF FLORIDA OR BY VISITING WWW.800HELPFLA.COM. REGISTRATION DOES NOT IMPLY ENDORSEMENT, APPROVAL, OR RECOMMENDATION BY THE STATE. 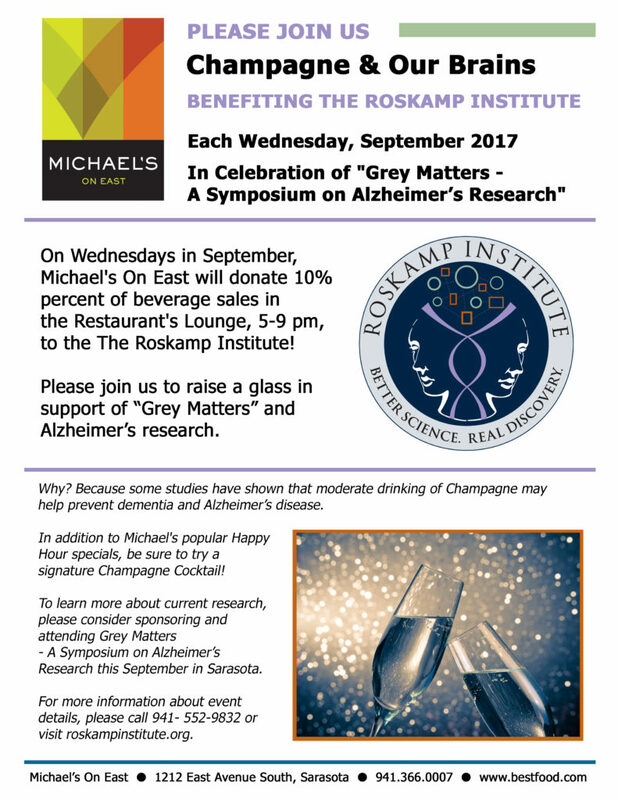 The Restaurant will be closed this Monday on Labor Day, but we look forward to serving you throughout the month of September 2017 - including a special happy hour opportunity each Wednesday evening in support of the Roskamp Institute​. Partners with the Catering sales staff to ensure clients’ needs are met, completes assigned tasks. Updates banquet event orders and calls in changes. Gathers all pertinent information for meetings. Ensures calendars/schedules are accurate, up to date. Monitors deadlines and follows-up to ensure guarantees & payments are timely. Distributes all information gathered on meetings, banquets and special events to staff. Completes & issues required correspondence thank you notes, notices, memos, etc. Ensures each Catering file is complete/accurate and submits to Accounting accurate final billings the day following an event. Strong telephone etiquette and shows genuine care and concern for customer’s needs. Reports to work on time and in professional business attire. Coordinates tastings for prospective clients & show table mock-ups. Inputs BEOs for tastings and amenities. Orders and maintains office supplies and equipment. Maintains files and equipment in an orderly and professional manner. Uses the property’s email system and maintains their email box, as is policy. Additionally, this position may or may not have access and/or control over the email box of Phil Mancini. Greets internal and external customers in a friendly and professional manner. Announces visitors and/or handles requests, as appropriate. Ensure load sheets are copied. Keeps catering menus current and in File Maker Pro. Looks up the availability of spaces on and off property so there are no conflicts. Posts function sheets downstairs one day prior to events. Workday is 9:00 AM – 5:30 PM (30 minutes for lunch). 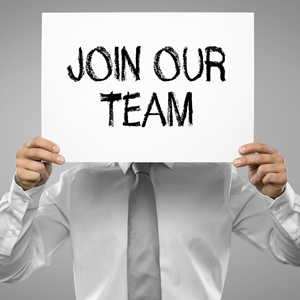 Requires 1 year administrative support experience. SPECIFIC JOB KNOWLEDGE, SKILL AND ABILITY The individual must possess the following knowledge, skills and abilities and be able to explain and demonstrate that he or she can perform the essential functions of the job, with or without reasonable accommodation. Ability to read, listen and communicates effectively in English and in writing, using correct grammar, spelling and sentence structure. Prepare official correspondence on behalf of management for both external and internal communications verbally and in writing. Ability to sit for extended periods of time and continuously perform the essential job functions. Ability to effectively transcribe information from handwritten memos and recordings. Michael's On East is a contemporary fine dining restaurant featuring an extraordinary supper club atmosphere, inspired cuisine and an intimate piano bar. 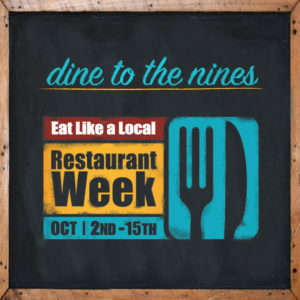 Founded on April 27, 1987, Michael's On East is located at 1212 East Avenue South in Midtown Plaza, the iconic restaurant is open for lunch 11:30 a.m. to 2 p.m. Monday through Friday, open for dinner 6 p.m. to close Monday through Thursday and 5:30 p.m. to close on Friday and Saturday. The restaurant is closed on Sundays, with the exception of Easter and Mother's Day each year. 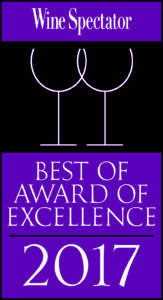 The establishment is the winner of the 2009 Fine Dining Hall of Fame, and received their 26th consecutive AAA Four-Diamond Award in 2015. 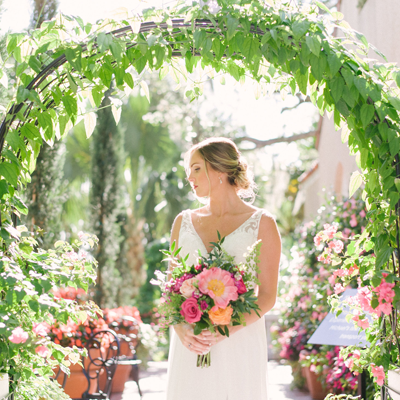 Michael's On East Catering is Sarasota's premiere caterer creating memorable events from candlelit dinners for two to dazzling galas for 1,000. Michael's Wine Cellar hosts more than 1,000 International estate-bottled wines including more than 200 Domaine wines under $20, boutique spirits and craft beers. Michael's Wine Cellar is open Monday through Saturday, 10 a.m. to 6 p.m. 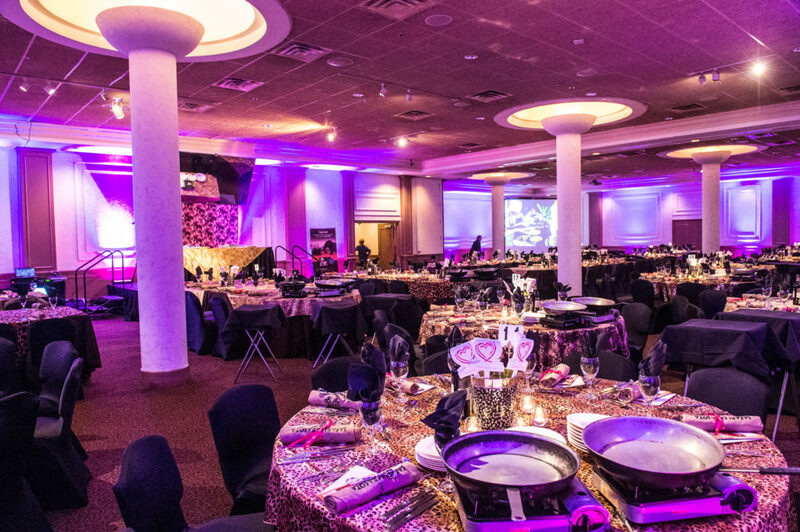 It's hard to believe, but it's time to finalize your holiday event plans! Our Co-Proprietors Michael Klauber and Philip Mancini wanted to offer a few photos for party inspiration. 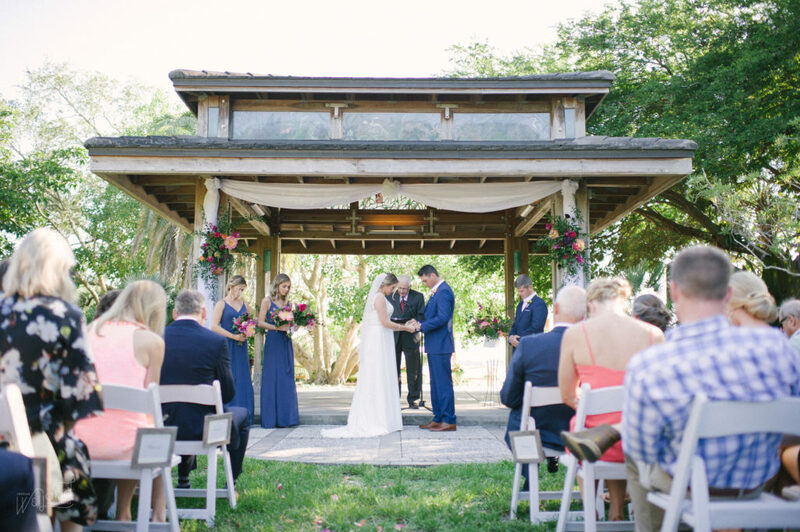 Contact our catering offices to check date availability for the Ballroom, Wine Cellar, Restaurant, Bay Preserve at Osprey and Selby Gardens as the calendar is starting to fill up quickly. It will be our team's honor to cater your personal or corporate holiday party this year! 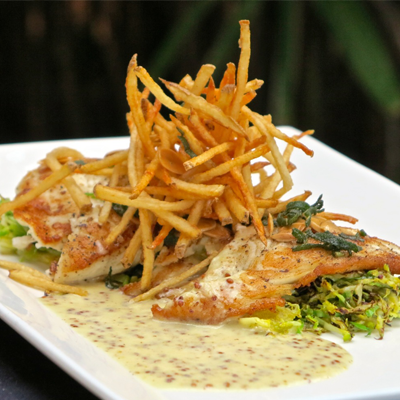 Butter-Roasted Flounder Grain Mustard Beurre Blanc, Brown Butter Sage, Toasted Almonds, Sautéed Brussels Sprouts & Potato Allumettes Created by Michael’s On East Executive Chef Jamil Pineda and featured on the award-winning Restaurant’s lunch menu. Serves 4 For the Flounder 4 7oz pieces of Flounder filets 3 Tablespoons Olive Oil Salt and Black Pepper to taste Method In a non-stick sauté pan over high heat, add the oil. Season the fish with salt and pepper. Sear the fish until golden brown on both sides. Set aside until the dish is ready to be plated. For the Brussels Sprouts 24 each Brussels Sprouts (Shaved) 2 tablespoons Olive Oil Salt and Black Pepper Method In a non-stick sauté pan over medium high heat, sauté the sprouts with oil. Add salt and pepper to taste and set aside until the dish is ready to be plated. For the Beurre Blanc 2 cups White Wine 1 Shallots, minced ¾ cup Champagne Vinegar 1 lb Butter ½ quarts Heavy Cream Pinch of Sugar 1 Tablespoon Grain Mustard Salt and Pepper to taste Method Reduce the wine with the shallots, sugar, and vinegar 3/4 of the way. Add cream and reduce again until you see heavy bubbles. Whisk the butter slowly until all the butter is emulsified. Add the mustard. Season with salt and pepper to taste. Set aside until the dish is ready to be plated. For the Brown Butter ½ lb Unsalted Butter 2 Tablespoons Toasted Almonds 1 Teaspoon Fresh Sage, chopped Method In a small sauce pan, add the butter and cook over high heat until it starts to turn brown. Add the sage and almonds. Set aside until the dish is ready to be plated. For the Allumettes 2 Baking Potatoes 1 qt Frying Oil Salt to taste Method Wash potatoes. Slice into 1/4-inch thick slices, then into 1/4-inch sticks. Wash thoroughly in cold water. Drain well. Deep fry in batches at 350 degrees until potatoes are cooked, but not brown. At serving time, increase the oil temperature to 375 degrees. Fry potatoes in batches, until golden brown. Sprinkle with salt. To Plate On four large plates, spoon the Brussels Sprouts in the middle of the plate. Top with fish, spoon the brown butter mix on top of the fish, then the beurre blanc across the fish. On the middle of the fish garnish with the fried potato allumettes and serve! 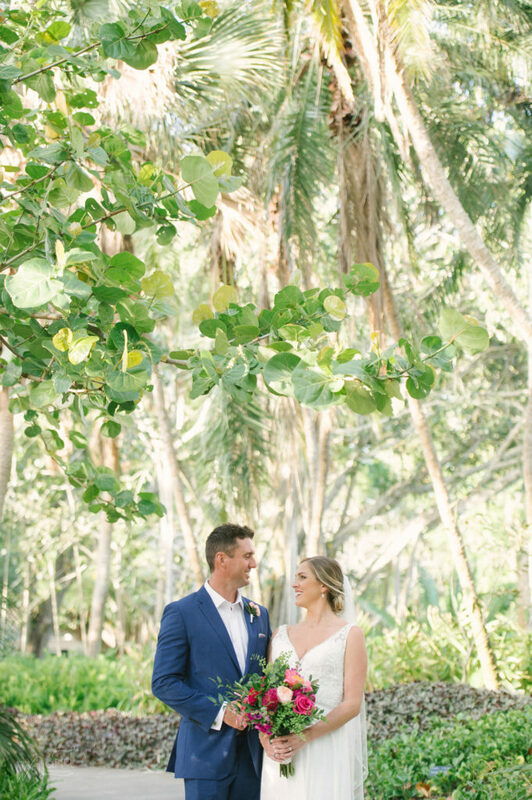 This past weekend our team hosted a men's tisch in the Restaurant, women's tisch in the Wine Cellar, ceremony in the Ballroom, cocktails back in the Restaurant, followed by dinner back in the Ballroom. What an honor it was to produce all of these wedding festivities all under the supervision of Rabbi Steinmetz. 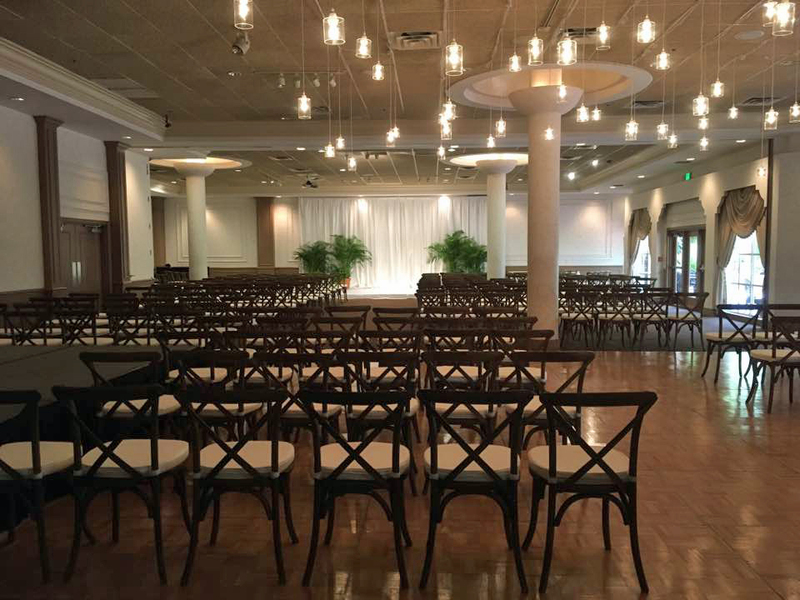 If you're interested in hosting a private function at Michael's or catering for a special event off-premise, please click here to request a proposal. We continue our All-Night Happy Hour on Mondays, now in support of Designing Daughters each Monday through July and August! 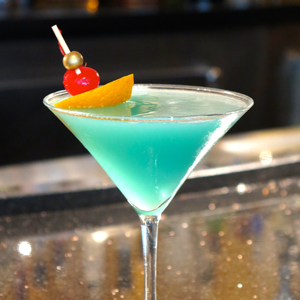 Please join us to take advantage of $6 beverage specials (Michael's Private Label Wines, Well Cocktails and Draft Beers) from 5-9 pm each Monday in the Michael's On East Lounge. 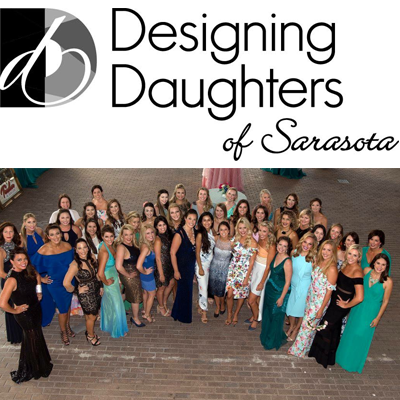 Click here to learn more about Designing Daughters. Chef Jamil stepped back into the kitchen at ABC 7 today to share a special recipe with our friends at Suncoast View! 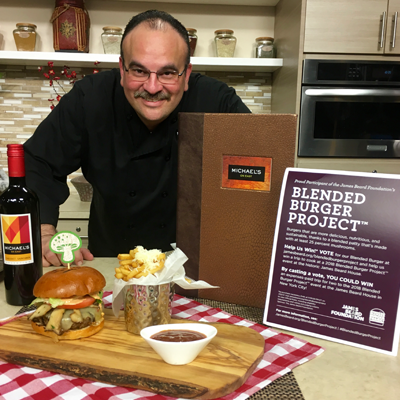 Tune in at 4 pm today, 9 amtomorrow (Wednesday), or watch online at mysuncoast.com for the full segment as Chef Jamil discusses The James Beard Foundation's Blended Burger Project and our Mighty Murf Burger. We also invite you to vote for Michael's On East as part of this James Beard Contest daily through July 31. Please click here to vote now! 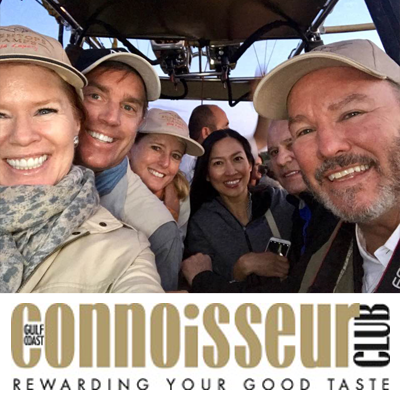 The first stage of this summer's Gulf Coast Connoisseur Club journey has concluded and our GCCC travelers were indeed fortunate enough to witness The Great Migration in Tanzania. Michael & Terri Klauber are leading 65 GCCC members, together with our partners at Admiral Travel International, on this amazing food and wine journey! 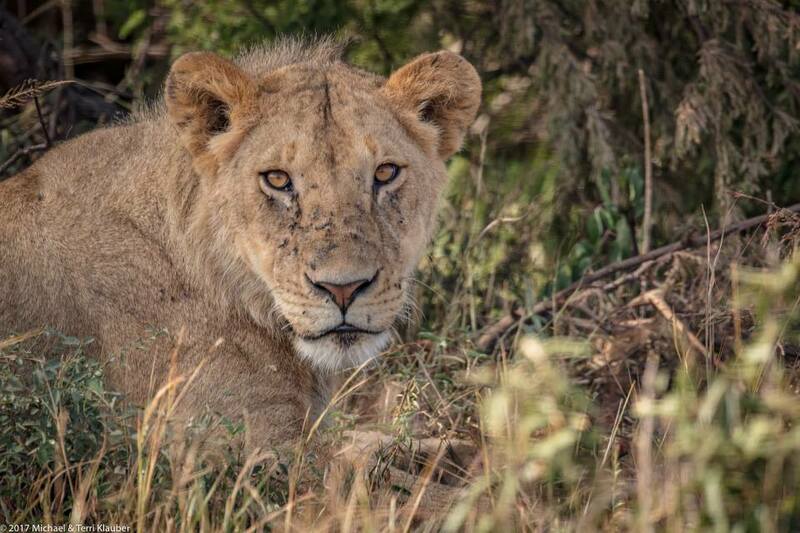 We hope you'll enjoy a few photo highlights by Michael and Terri Klauber. Stay tuned to our Facebook page for more photos as the group(s) continue through the Cape Winelands in South Africa. 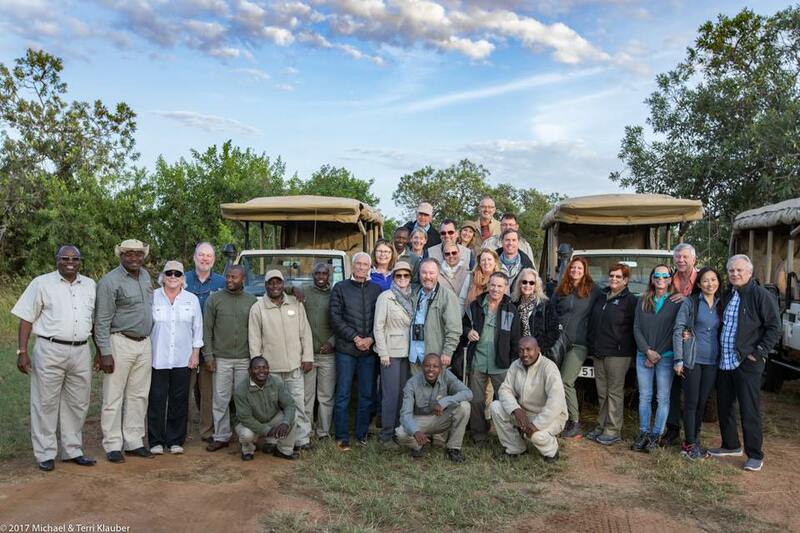 In fact, the group recently arrived at Londolozi Game Reserve and have been reunited with the Klaubers' good friend Londolozi's Executive Chef Anna Ridgewell! 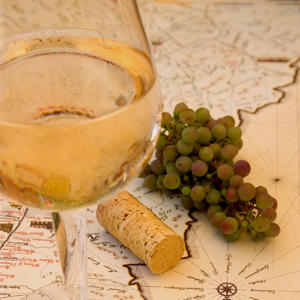 If you are ready to join the GCCC's next culinary journey around the world, take a look at the special 2018 itineraries now available: Sip & Savor Europe& Taste of the British Isles.